I'm Out in the Desert....or Am I? 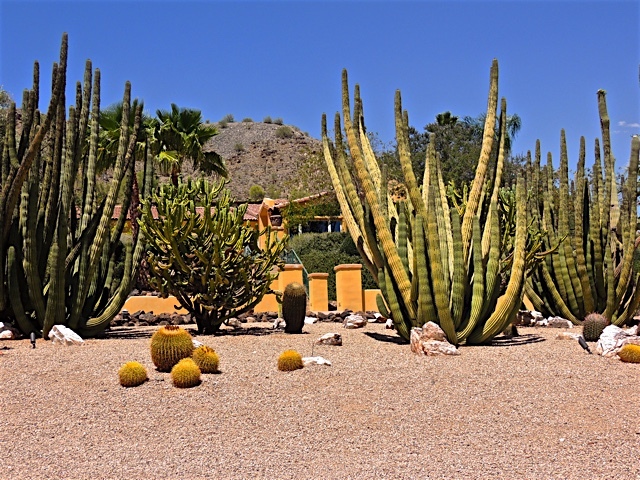 There is a home in Paradise Valley that has the biggest cactus garden in front of it that I've ever seen. If it weren't for those light fixtures out front, you'd think I took this shot out at one of our state parks. But, there really is a home back there behind that wall of cactus! 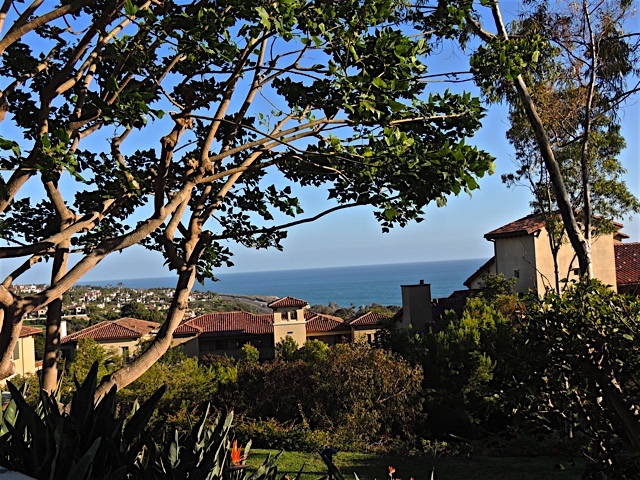 I returned Sunday evening from another fabulous weekend in California with my good friends Julie and Dave. It was so nice to get away from the Arizona heat for a while and enjoy the beautiful, blue Pacific Ocean out there in front of me. I had a great time just relaxing, walking, doing a tiny bit of shopping and doing plenty of great eating. 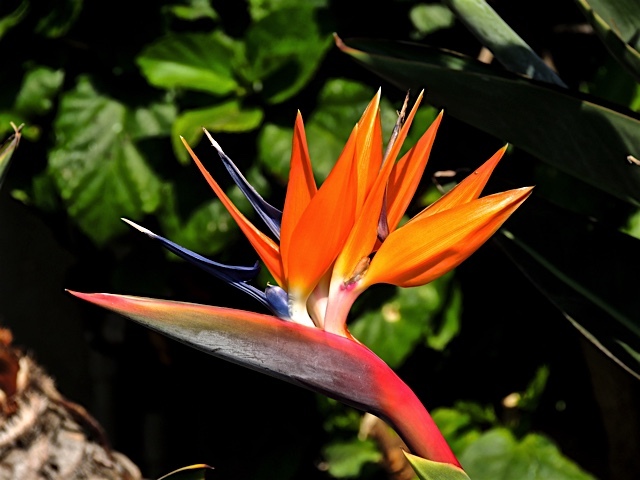 I always enjoy seeing the exotic plants that seem to grow like weeds in the California climate. 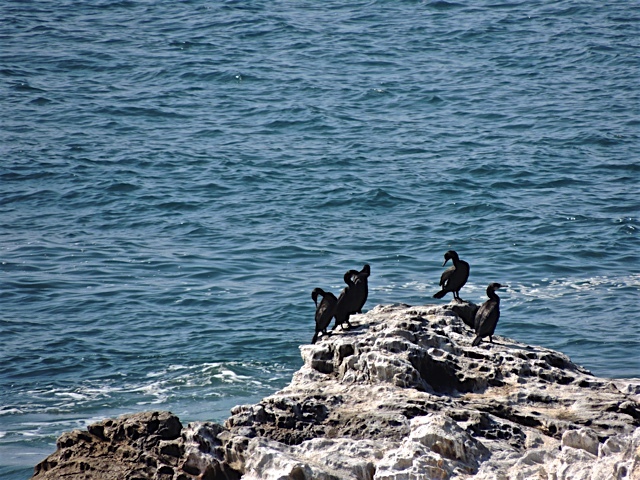 And watching the interesting sea birds as they hang out in their private resting spot. It was a great weekend full of laughter, food and some very good wine! 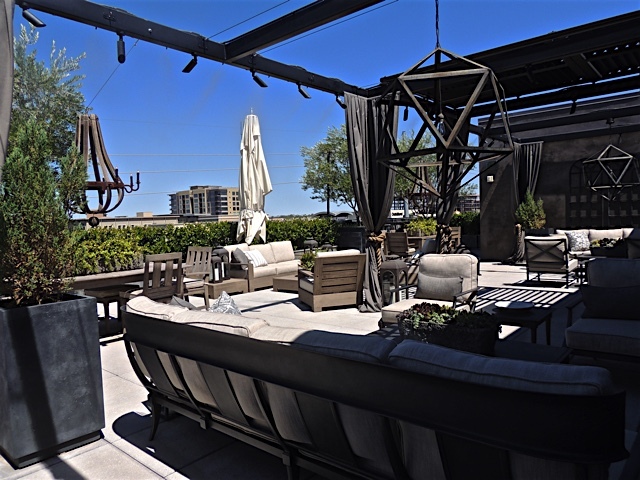 AZ88 is a very popular and very eclectic restaurant located at the Civic Center in Scottsdale, just across from the Performing Arts Center. And, it happens to served my all-time favorite burger. 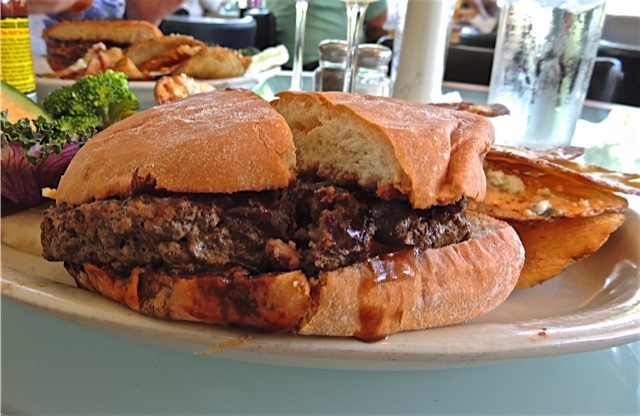 Yes, I've posted about some tasty burgers on this site lately but, this one is still my favorite. 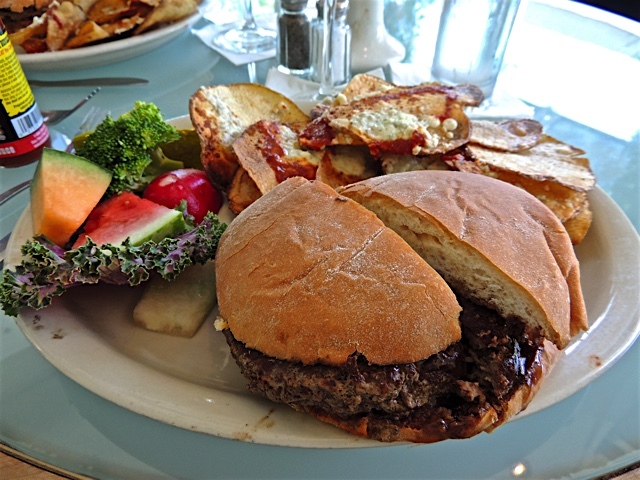 It's called the Burger Au Poivre and it is made with peppercorns, minced onion and a burgundy sauce. Also on the plate is my favorite accompaniment, Hell's Fire Chips. Those are house made potato chips covered with hot sauce and blue cheese. Yum! They have been serving up this delicious burger since the place opened and it's always sheer perfection. 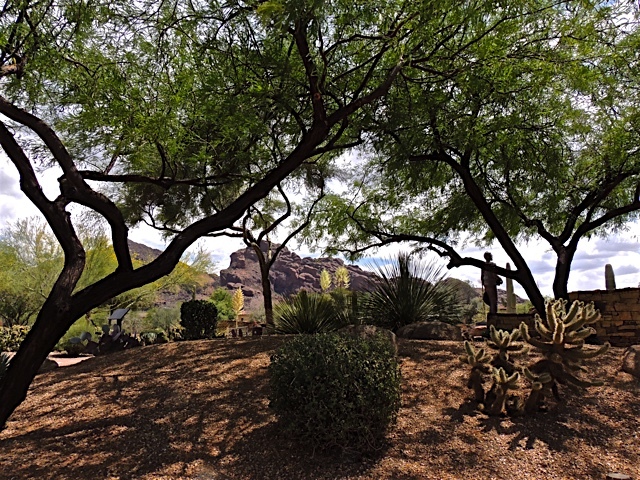 Last weekend, I headed over to AZ88 in Scottsdale with a friend for lunch. I've posted about AZ88 before. It's my my all-time favorite place for a burger but, more about that tomorrow. 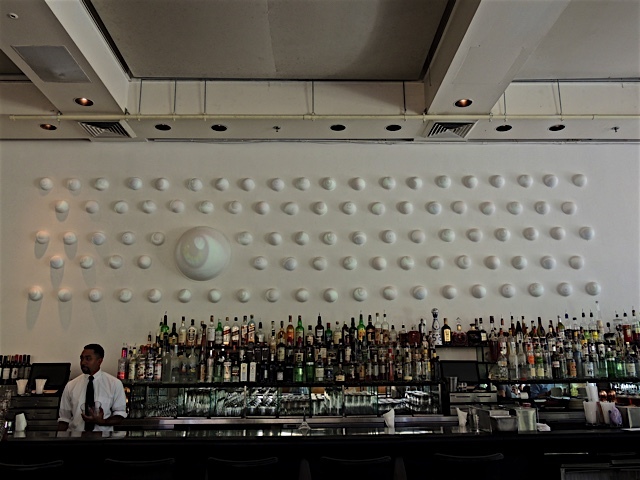 I think in one of my previous posts, I might have mentioned that the restaurant is constantly changing it's artistic decor with something new and very inventive. 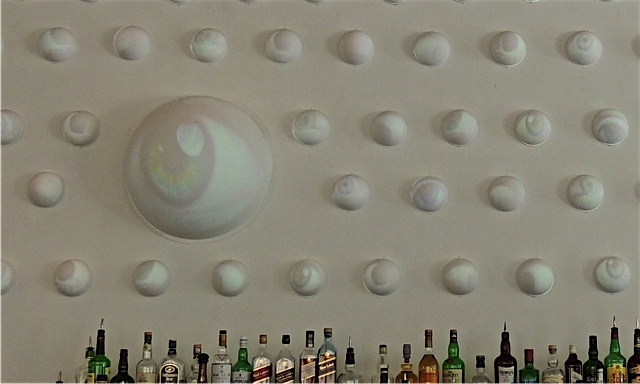 This time it was a row of eyeballs above the bar. They are a little hard to see in this photo because it was very bright in the restaurant but, each one of those round dots has a blinking eyeball projected on to it and the one giant eyeball in the middle. I cropped the photo down to give you a better look. The eyes kept moving back and forth and blinking and they all moved and blinked individually. It was quite an interesting achievement as is fitting for this very eclectic restaurant. I hoped to catch them at night sometime when they would photograph better but, the waiter said they would be coming down soon and a new exhibit going up. They tend to change the decor with the season. I have a new post on Sharon's Sojourns today. Did you know there were pyramids in Canada? I spotted these wicked looking shoes at a local shop and couldn't help taking a photo of them. 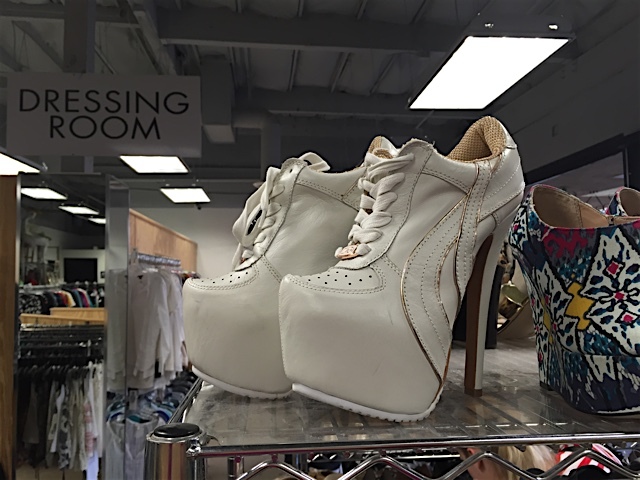 I can't imagine who would wear them but, they were gone the next time I went in. Maybe someone was putting together a little something for a costume party. 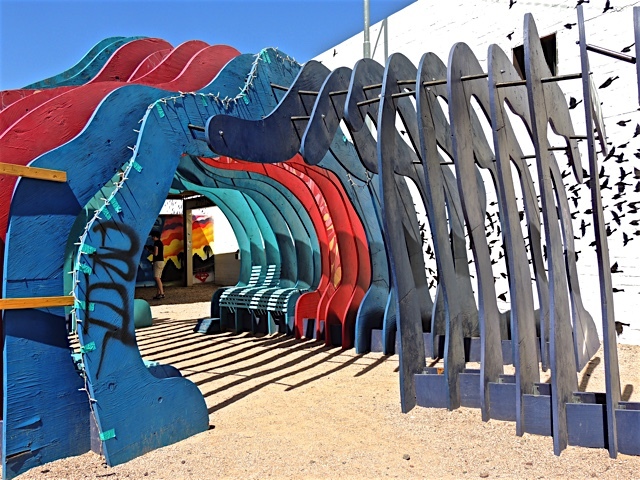 The last time I was at the Scottsdale Museum of Contemporary Art, one of the docents asked me if I had ever seen the sculpture on the patio of the museum. 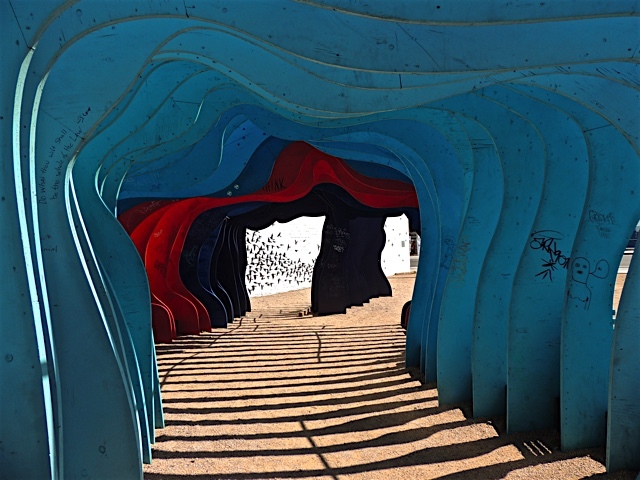 He said it is an interesting piece, so I followed the path outside and around a corner and came to a round room with a huge opening in the center of the ceiling. It turns out, this was the sculpture. 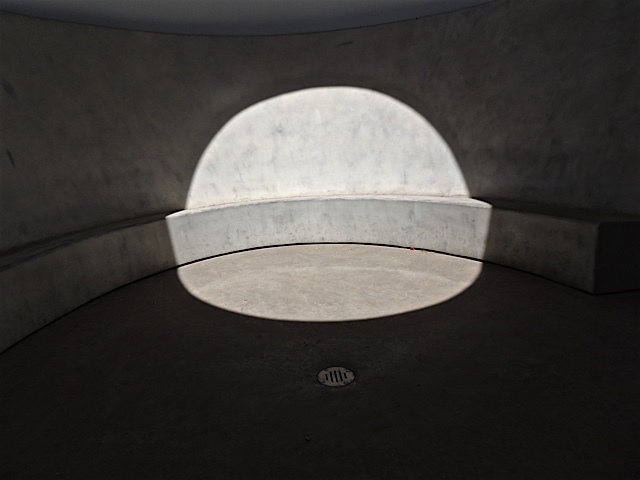 Looking down, there is a ridge around the walls that forms a sort of bench and of course, the sun shining through that opening created a huge sun spot in the room. 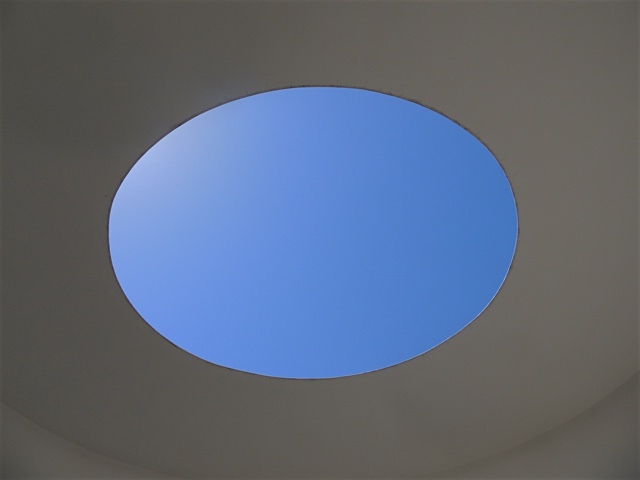 The sculptor is James Turrell and the piece is called Knight Rise. 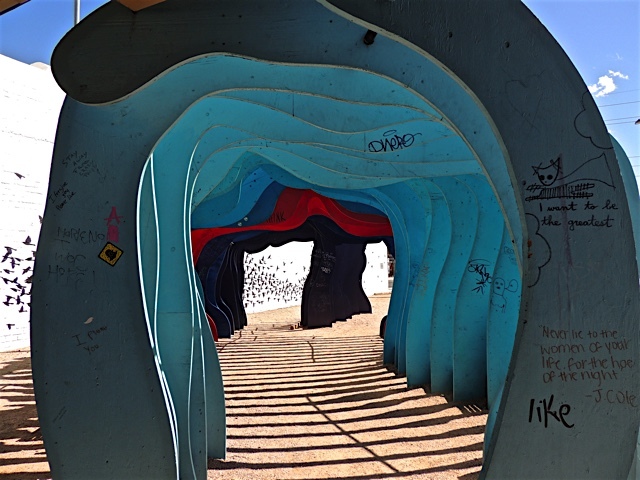 Its made of Venetian plaster, concrete, steel and neon. At night, the neon lights upward from that ridge just above the sun spot in the photo above. 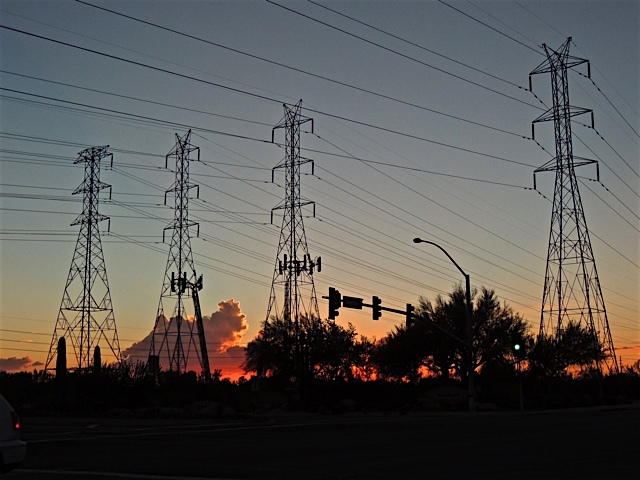 If you would like to see what it looks like at different times of day, click this link. You will see a short slide show of photos taken and different times. I love it! I'll be checking it out every time I go to the museum to see how it looks at different times. I found another sculpture in the Heard Museum gardens that I haven't featured before. This one is by Doug Hyde and it's called "Navajo Water Girl". In the late 60's, Doug Hyde went to the Institute of American Indian Arts in Santa Fe New Mexico where he became friends with Allan Houser. He still lives and works in Santa Fe today. 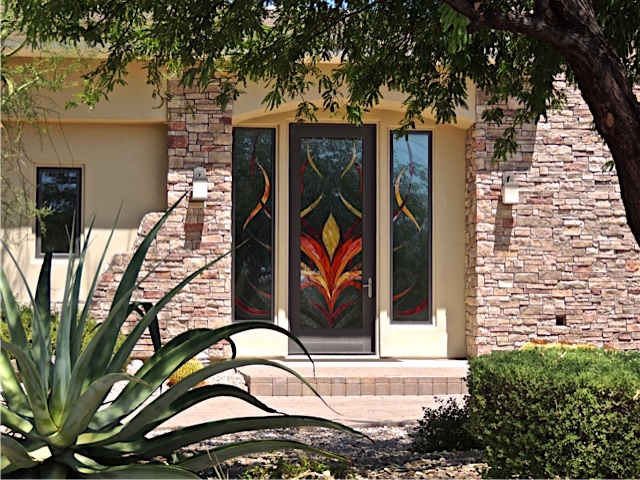 I love the stained glass door and windows on the entrance to this Paradise Valley home. It makes a very welcoming way to enter this nice home. 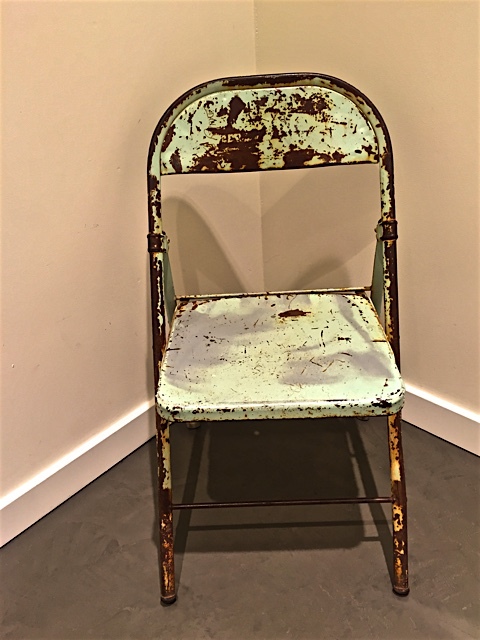 I found this rusty old folding chair inside the dressing room of a shop at Scottsdale Fashion Square. It's a kind of unusual thing to find in a dressing room but, I liked it. I think it would look great out in a meadow somewhere. Now that would really make a great photo. Just a lone rusty chair in the middle of green meadow with a scattering of wildflowers around it. 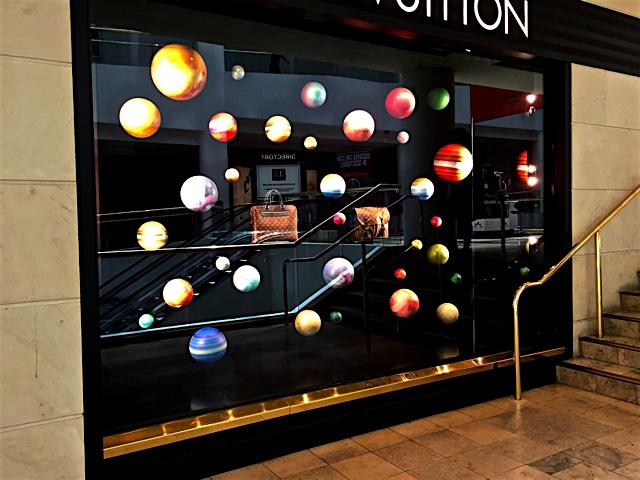 It looks like Louis Vuitton is trying to align the planets around two of it's very expensive handbags. This window display caught my eye with all those colorful planets floating around behind the glass. No, I didn't go in the store. I'd have to win the lottery to shop in there. I just admired the colorfully painted planets instead. I got my first taste of the Hatch chili season on Friday when I had lunch at Z Tejas restaurant. Around the first part of September, restaurants start offering Hatch chili specials so this was the first one I"ve seen. 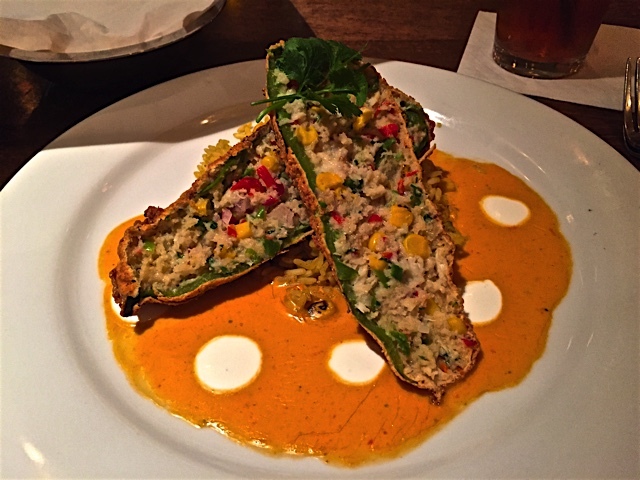 I ordered the Hatch chili relleno stuffed with shrimp and crab and coated in cornmeal. The dish was delicious. I'll be looking forward to more features in the next few weeks. Hatch chilies are grown in New Mexico and they are so popular at harvest time, that many people drive all the way to New Mexico to get some and bring them back. I'll keep my eyes open for places that are roasting chilies as the season approaches so I can get a photo of those big roasters. I have a new post on Sharon's Sojourns today. It's a quick stop in a pretty little city in Maryland. 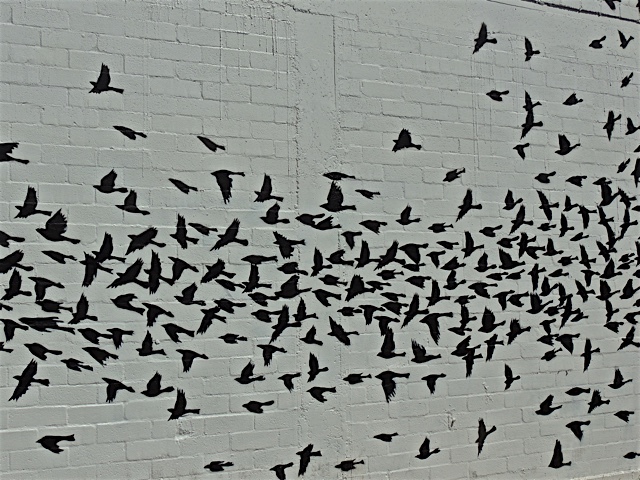 Next to the wall with all the birds that I featured yesterday, is this strange structure that forms a sort of tunnel. It kind of gives the impression of being in a cave but with the sun shining in. I couldn't find any signs indicating what it represents but since it's pretty much covered in graffiti, maybe the sign is long gone. 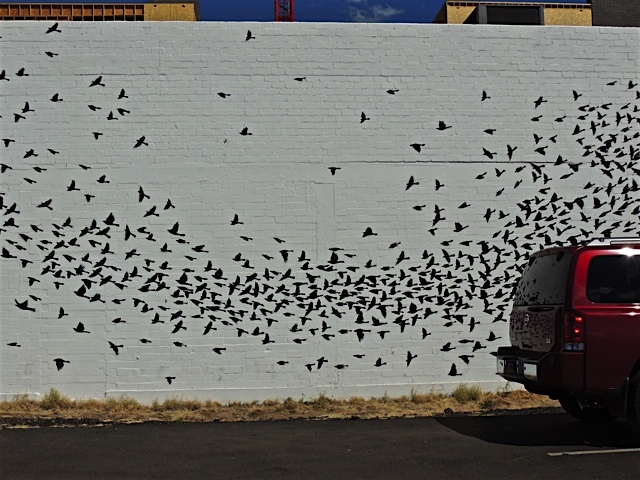 I parked my car in a small downtown parking lot near an art gallery I was going to visit and I saw all these birds flying off in one direction. I walked closer to get another look but because of another wall abutting this wall, I couldn't see any significance to the mural. 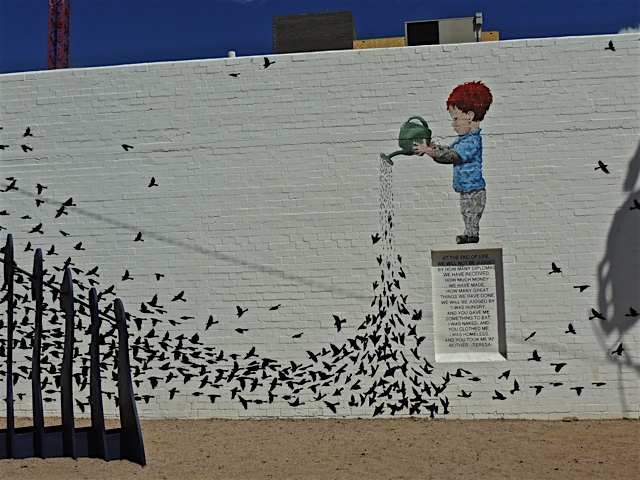 When I walked around the wall to toward the front of the gallery, I saw this little red-headed fellow with his watering can that seemed to turn into a large quantity of birds. The quote inside the box under the little boy doesn't give me any clues either. It's a quote by Mother Teresa that says: "At the end of life, we will not be judged by how many diplomas we have received, how much money we have made, how many great things we have done. We will be judged by "I was hungry and you gave me something to eat, I was naked, and you clothed me. I was homeless and you took me in." Tomorrow I'll show you what that funny looking thing to the left of the above photo is. These two buildings couldn't be more different. On the left is the Orpheum Theatre which opened it's doors in 1929. On the right is the huge AT&T/Century Link facility with the tall microwave towers on top. 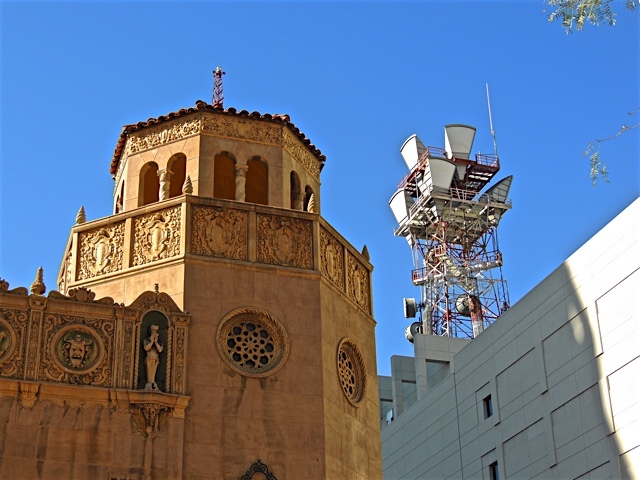 The two buildings sit across the street from each other in downtown Phoenix. 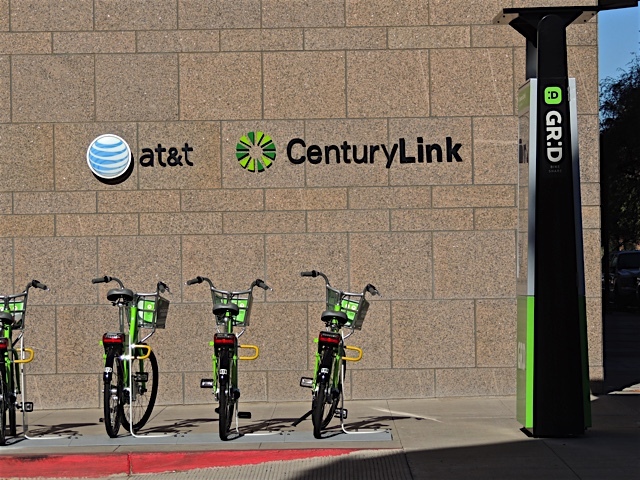 The Grid rental bikes blend right in with that Century Link logo! 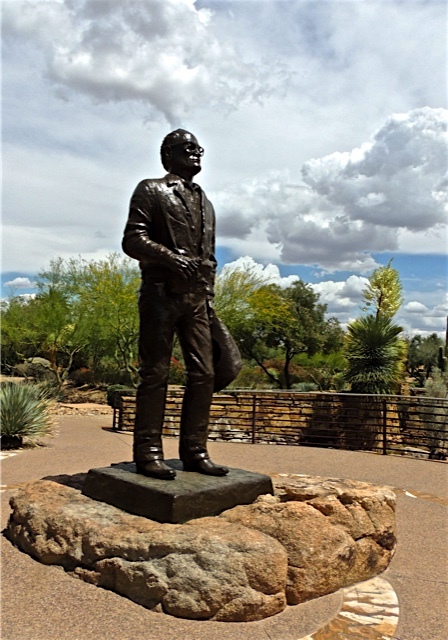 I stopped at the Barry Goldwater Memorial a week or so ago to update my photos. I did a post about this statue before but it was way back in 2008. I think it's due for an update. 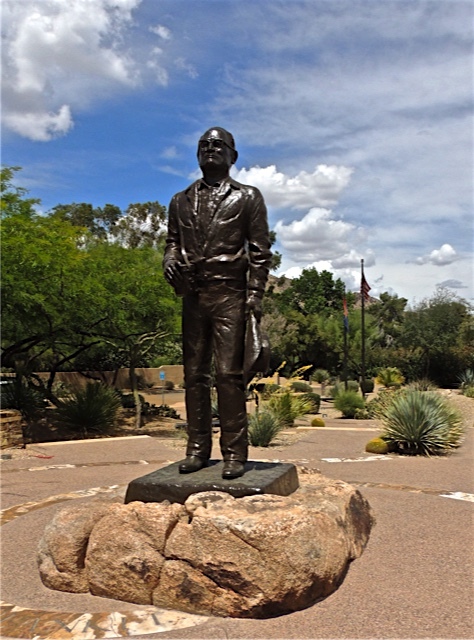 The statue was sculpted by Joe Beeler who happened to be a friend of Goldwater's when he was living in the town of Paradise Valley. Goldwater served five terms as a US Senator and ran for President in 1964. 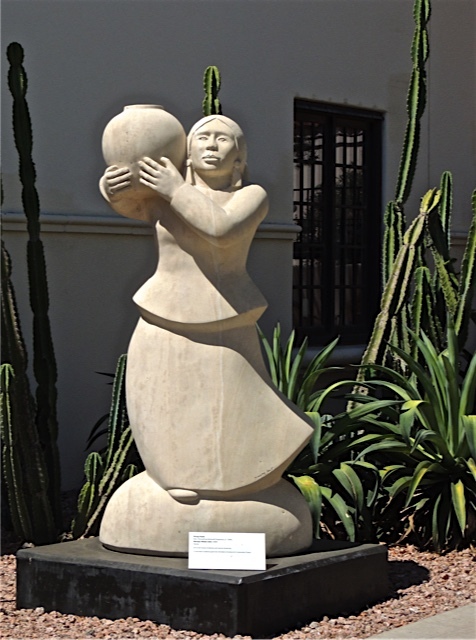 The statue sits in a small park in the town of Paradise Valley. Not many people stop here so when I was there taking photos I had it all to myself. 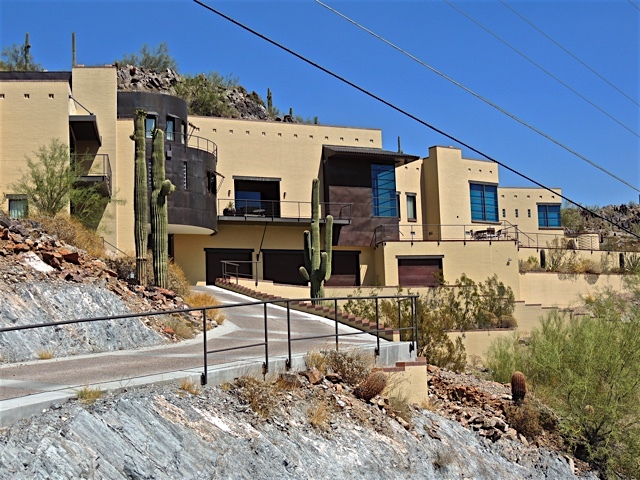 On the same day I made my way up the mountain to see the Lykes house that I featured yesterday, I saw a few other homes that attracted my attention. The one above seems to have sort a mimicked the FLW style in a more modern way. 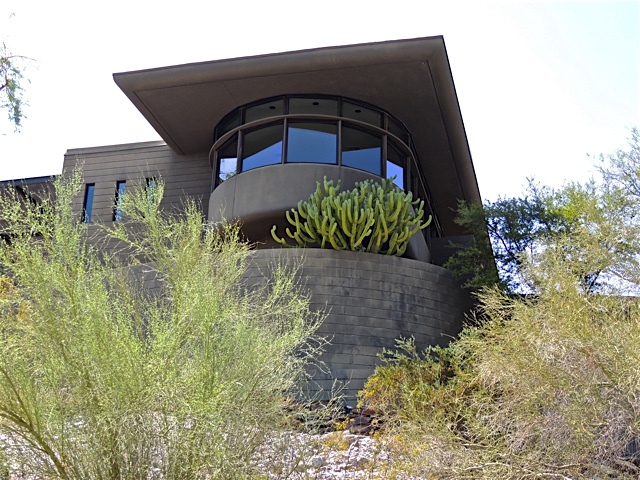 I do love that huge cactus growing out from the lower balcony. This home sits right below the Lykes house and also has some pretty spectacular views over the city. 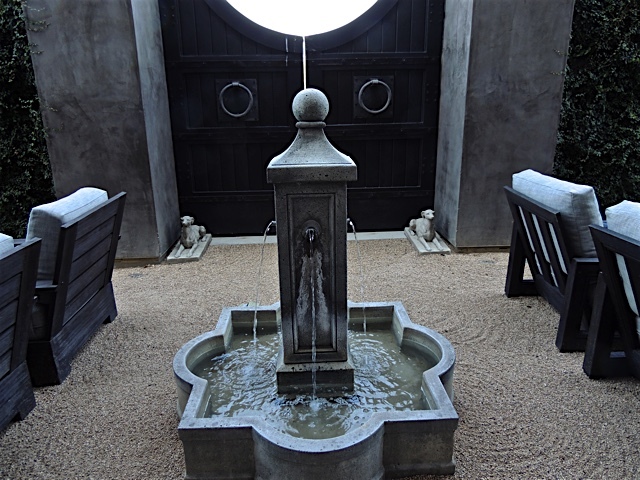 It also has a fabulous patio that would be perfect for parties. This home was also below the Lykes house and on the other side of the road. It is built on several layers that tend to follow the hillside downward. It is a huge home that looks more like a resort than a house. 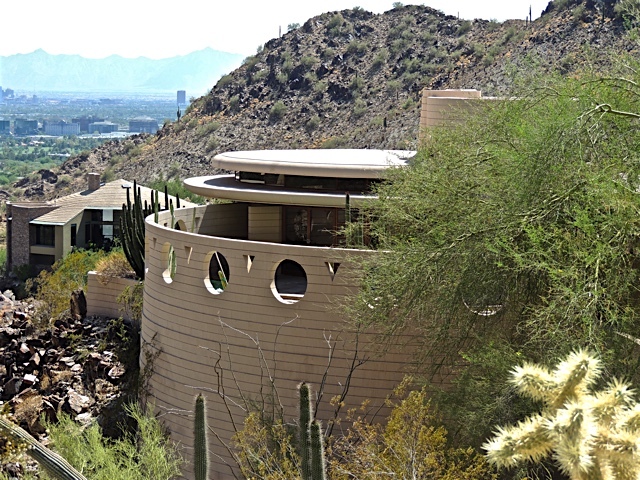 Way back in 2009, I had a post about this house, the last home designed by Frank Lloyd Wright. I recently took another drive up the mountain and found myself right next to this beautiful home. 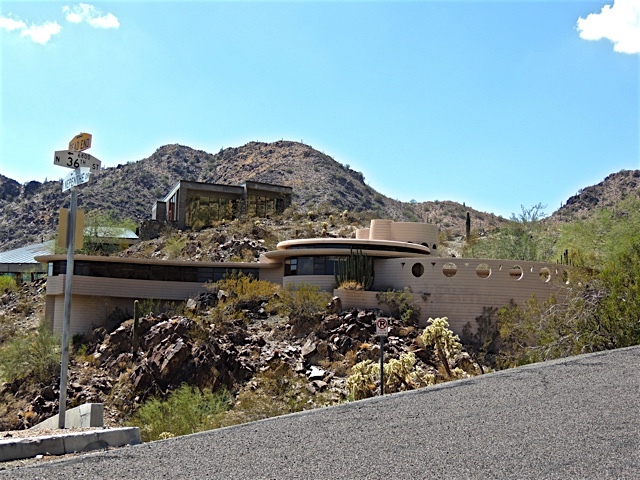 It was built for Norman and Aime Lykes in 1967 but, it was the last home Wright designed before he passed away in 1959. The home was built by an apprentice of Wright's, John Rattenbury. Apparently, this house was put on the market early this year. I found a listing for it at $3.6 million dollars. I didn't see any record that it actually sold but, I'm assuming it did. If you click the "listing" link above, that site has some pictures from inside the house. 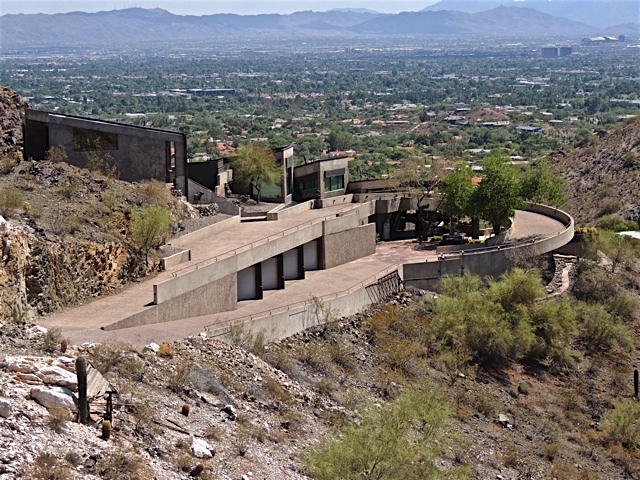 You can tell from the second shot that the home has some fabulous views over the city of Phoenix. I bet it's spectacular at night. The house reminds me very much of the David and Gladys Wright house that I featured on January 28th, 29th, and the 30th of this year. It has that same rounded, almost snake-like design. The similarities make sense since both homes were designed late in the architect's life. 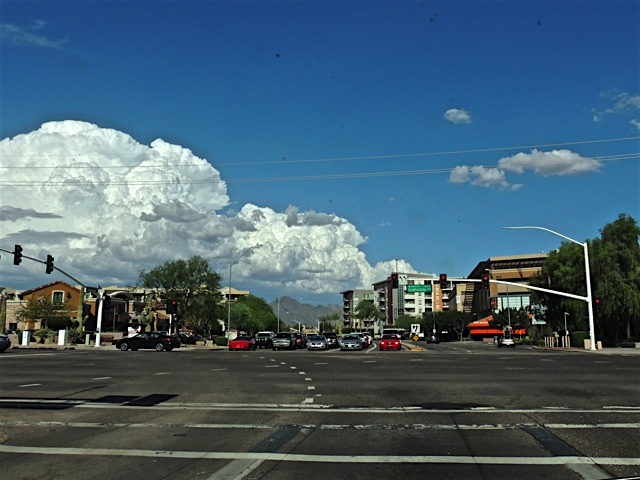 I took a long drive out to far North Scottsdale late Friday afternoon to meet some friends and on the way I noticed a huge buildup of big, puffy clouds headed this way. 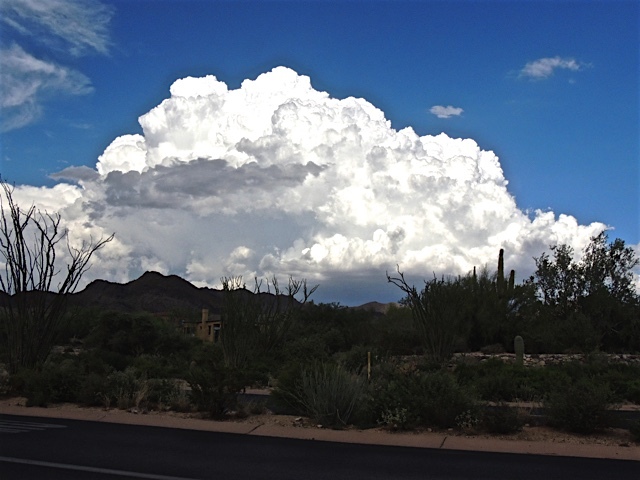 I drove a little way past my destination in order to capture some of those spectacular clouds. They were such a brilliant white. 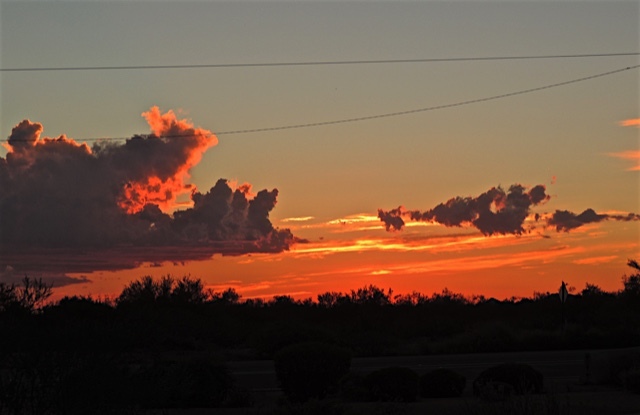 Later when I was driving back toward home I could see an interesting sunset building up. So I found another place to pull over and get a shot before it faded away. I have a new post on Sharon's Sojourns today. 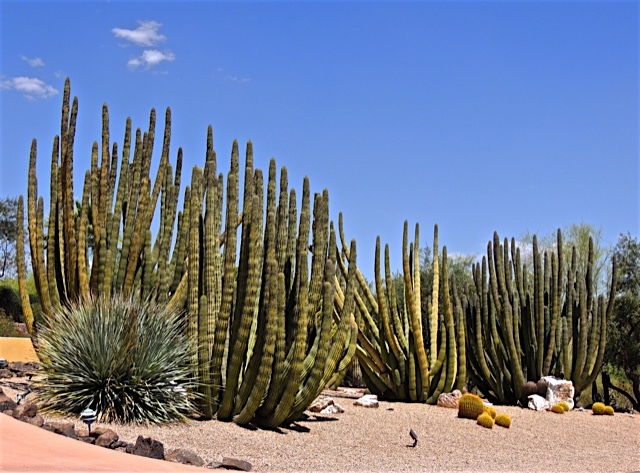 I'm visiting one of my favorite gardens located 60 miles east of Phoenix. 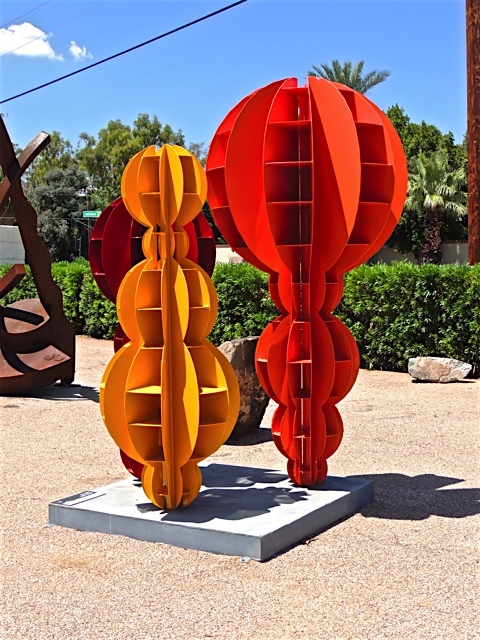 When I'm driving toward Scottsdale, I pass the Shemer Art Center and recently I've seen the top of a very colorful sculpture peeking over the wall. I finally stopped by to take a look at this bright piece. 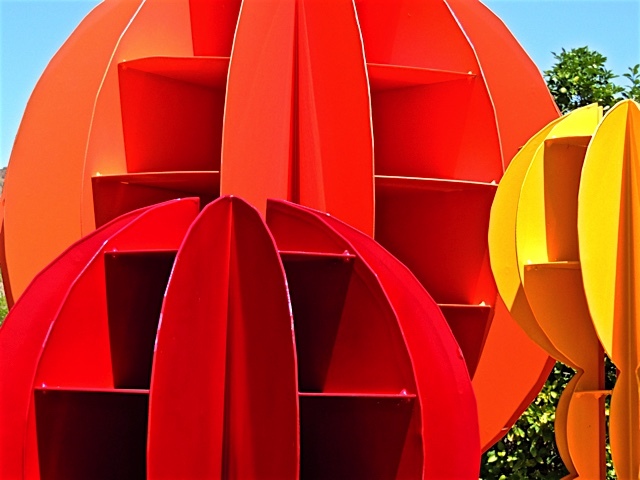 It's a piece called "Radial Joy" by artist Shelby Larson. It does make me smile so I think it lives up to it's name. After yesterday's post, I thought I'd offer a few matchbooks from my own collection. I've been collecting them for.....well....let's just say many, many years. I keep them in a large glass vase that I tipped over just to grab a few to photograph. There are quite few in here from places that don't even exist any longer. 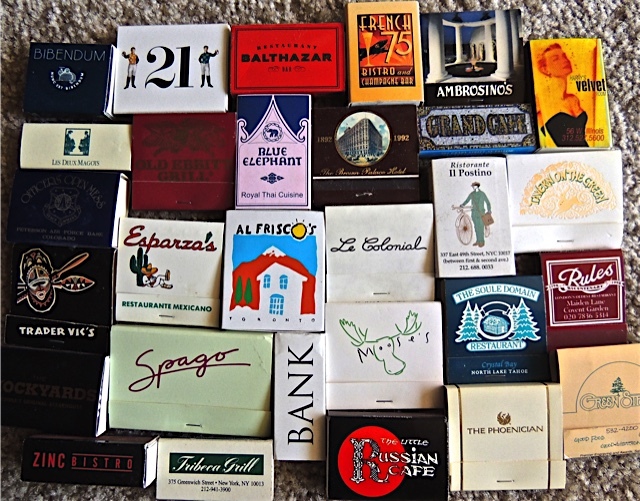 Collecting matchbooks is one of those lost arts because no one really has matches any longer since smoking is no longer acceptable inside any building. I don't think I've thrown a new matchbook into this jar for a very long time. 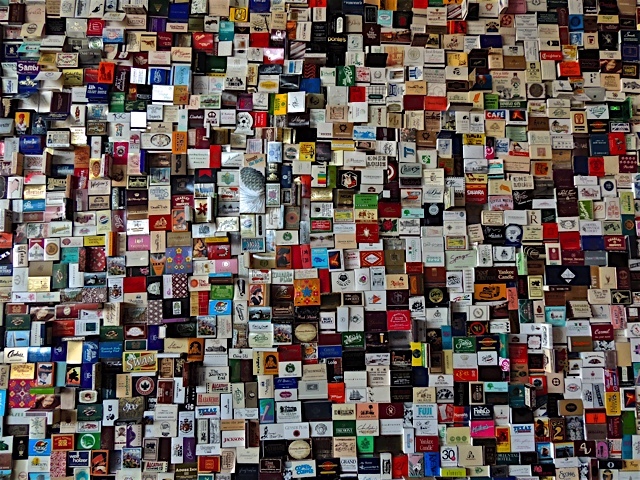 Earlier this year, I got an email from a locally owned wine bar/cafe where I occasionally meet friends asking if I had any matchbooks I could donate that would become part of the decor at their new place in Scottsdale. They were offering coupons for a certain number of matchbooks. At the time, I wondered how on earth matchbooks would figure into the decor at the new place. Last Sunday I met some friends for a movie and after the movie we decided to try out the new Postino's Wine Bar Cafe located in Scottsdale near Scottsdale Fashion Square. 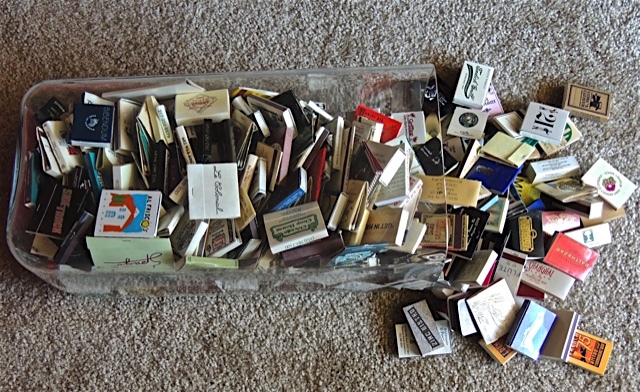 I finally figured out how they used all those matchbooks they collected. They covered one whole long wall with them. Postino's started in Phoenix way back in 2001 when a group of friends started a wine bar in an east Phoenix neighborhood in a building that was once a post office. That's how the name came about. Their idea was to not tear down and old building but to make something out of it that would enhance the community around it and they've been doing that ever since. 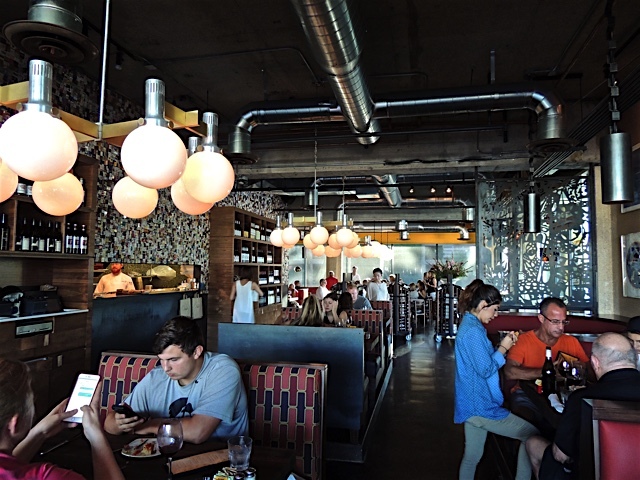 There are now seven locations of Postino's and a few more restaurants have also been developed in the process. They all have been set up in older buildings that have now been brought back to life and have become extremely popular destinations. Sounds like their idea has turned into a huge success. 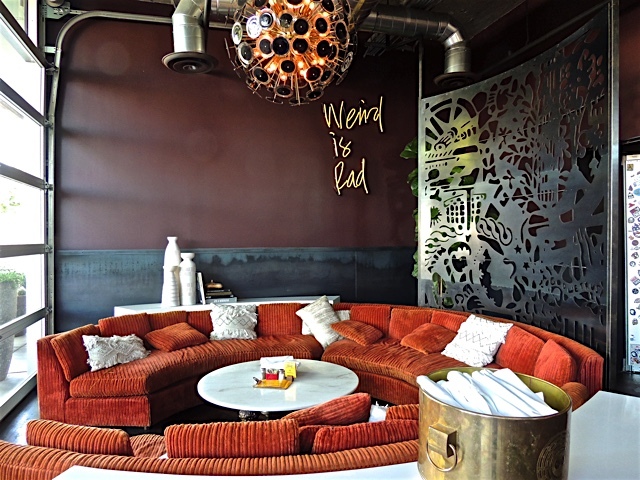 This little "Weird is Rad" space at the new restaurant looks like the perfect place to celebrate something special with a big group of friends, don't you think? 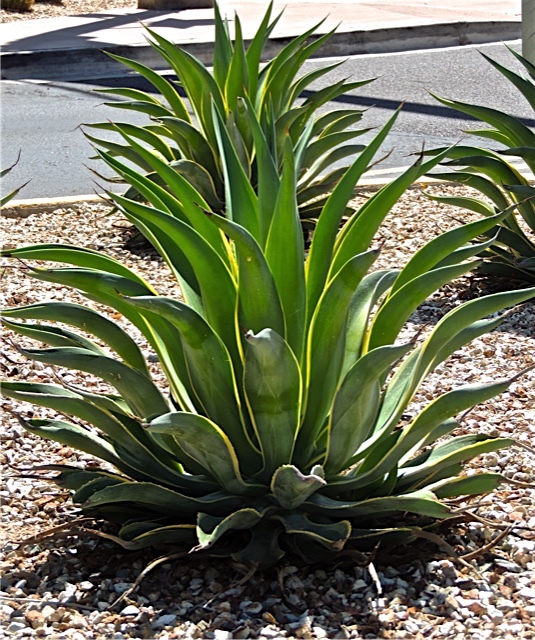 I loved the shape of this agave that I saw planted near the entrance drive to the Heard Museum. As I sat at the traffic light, I rolled down the window and took a picture of it. 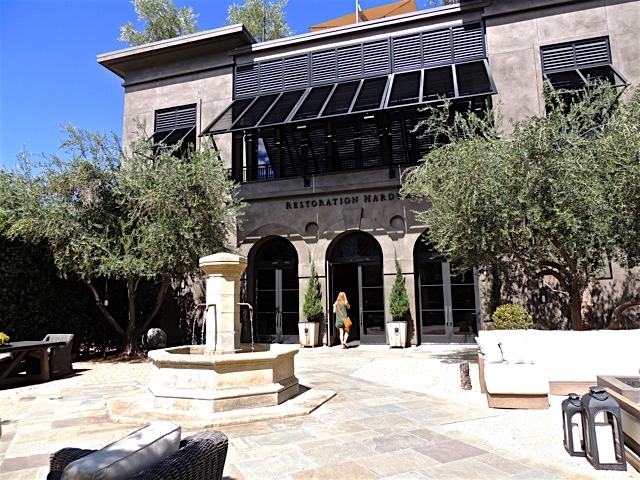 Continuing from yesterday's post, I stepped out on to the third floor patio furniture area of the new Restoration Hardware and made my way over the the edge to catch the view. 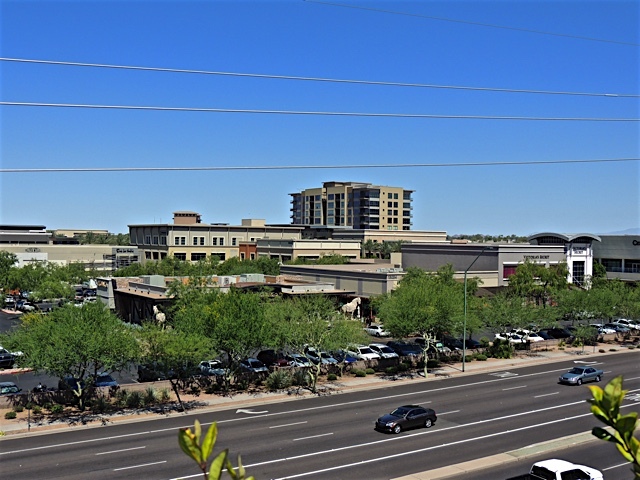 Looking just slightly north, I was looking right over the top of Kierland Commons, the shopping center I visit often to have a meal at Zinc Bistro. Near the center of this photo you can see the big white stone horse that sits in front of the PF Chang's restaurant that is also located here. That's Scottsdale Road down there in front. Looking straight west, I saw this mountain view. I'm not positive what mountain this is. 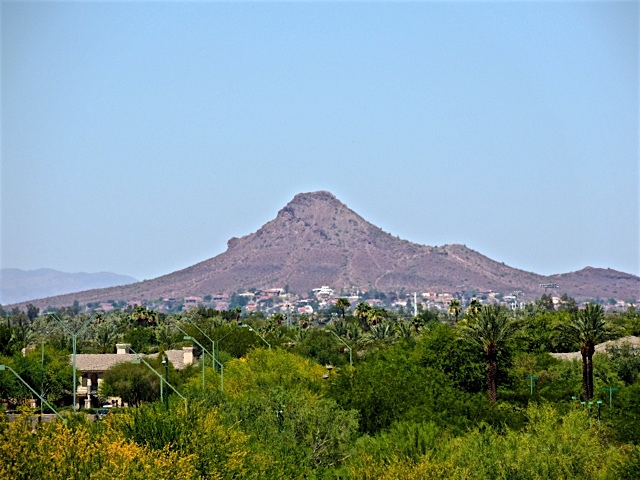 I looked at my map of the Phoenix area and I think it could be over toward Lookout Mountain Preserve. When I was in North Scottsdale a few weeks ago meeting a friend at the Scottsdale Quarter shopping center, I happened upon this store that I thought at first was some type of grand restaurant. It had such an elegant exterior with a large gate across the entrance and a valet-like attendant that I thought for sure this was an expensive club of some sort. It turns out to be a Restoration Hardware store. There used to be a Restoration Hardware store at Biltmore Fashion Park several years ago and it looked nothing like this place. It was small and featured mostly small items and all kinds of hardware you might use to restore some old furniture. Boy has this place changed. 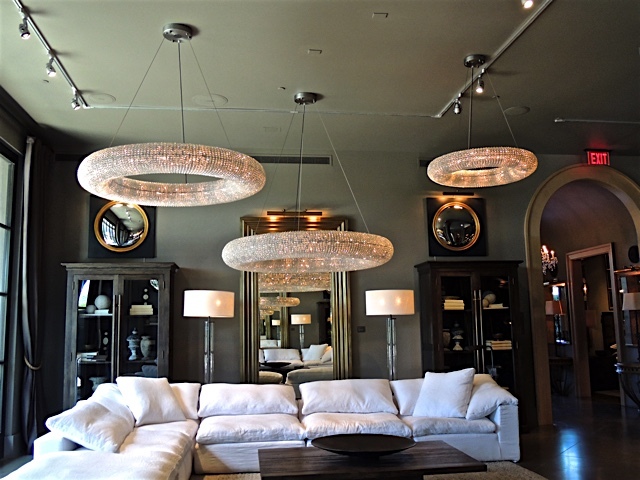 Now the store carries everything you might need to decorate your home from furniture to lighting to decorator items like sculptures and pictures. This store is three stories of demonstration rooms all gorgeously decorated. 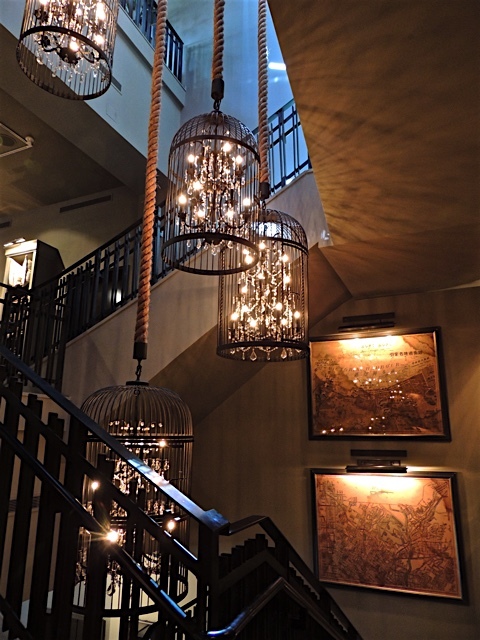 It looks like Restoration Hardware has changed their business focus and is now into some serious decorating. The third floor of this store offered lots of garden and patio furniture as well as a great view. Tomorrow I'll show the views from up there.